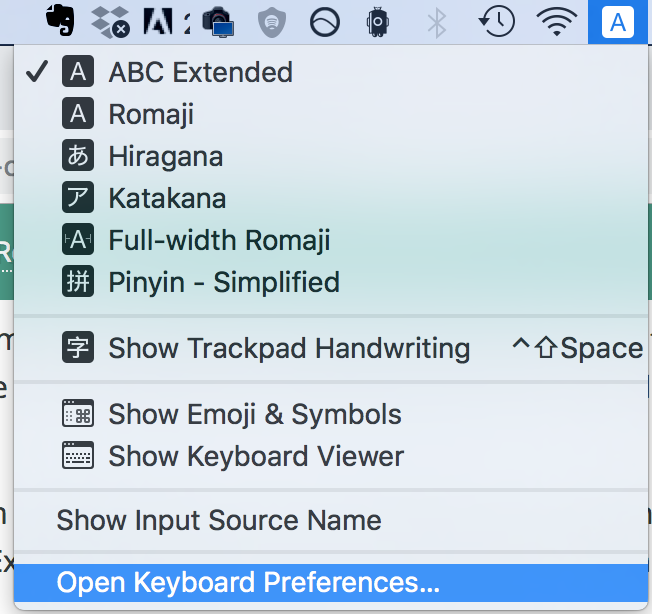 How do I type Esperanto's characters on a Mac? We have a resources section which contains info on how to type Esperanto's special letters. I don't have a Mac so don't know the best ways. And that means I can't actually write this part of the site! If you're a Mac owner, what's your preferred solution? If possible, please give me a little more detail than "Use x". If you can explain it using steps and images, that'd be great even better. You might even get your answer placed here! I use the ABC Extended keyboard layout, which allows you to type (pretty much) any accented character via dead keys accessible through alt. So to type ŝ I hit Alt-8, then type 's'. It's a bit slower than having a custom keyboard layout, but it means I don't have to faff around switching layouts when I'm zipping from one language to another. I've not included your file, @kashtanulo, because Chrome's just thrown up a security warning. I know there's nothing malicious and it's just doing it because it's an executable file but I'll be the one fielding complaints when other people download it and think we're linking to something dodgy. Thanks, @arielbonkorpa, but please remember that I'm not a Mac user so can't embellish your explanation as required to help others understand. 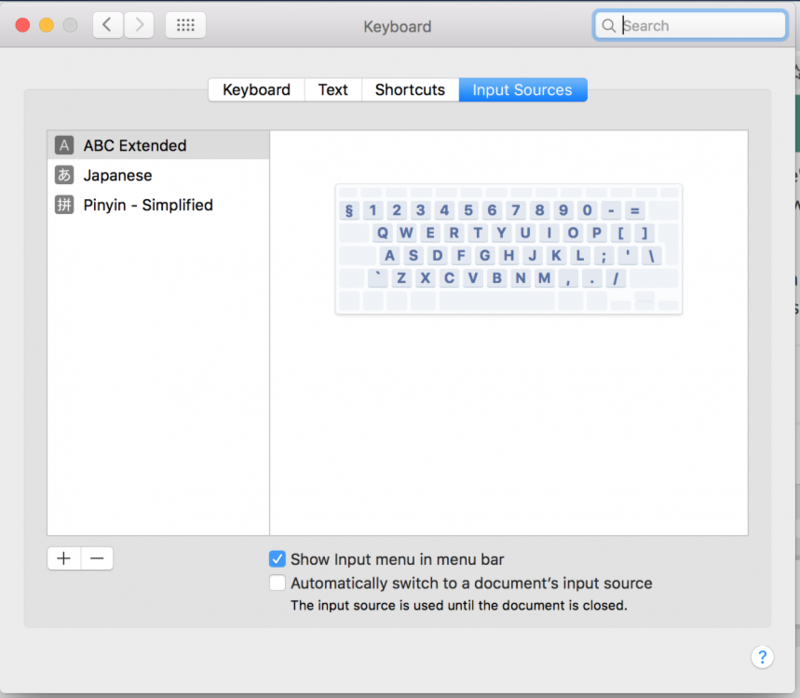 How does one somebody select the ABC Extended keyboard layout, for example? Screenshots would be even better. Here are some screenshots of how I add a new keyboard. If you don't have any extra keyboard layouts installed, you may have to access the keyboard preferences through System Preferences. ABC Extended is grayed out as I already have it added. 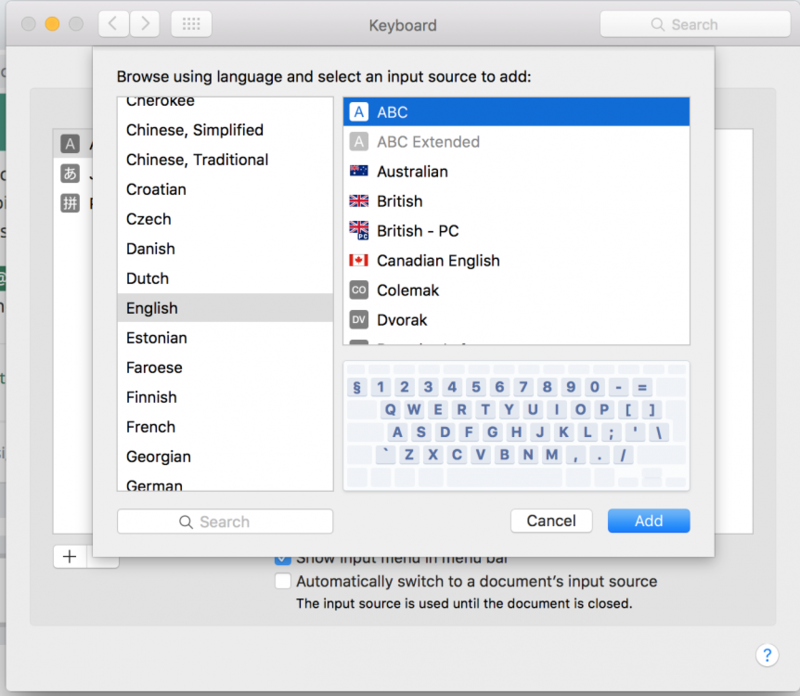 I have the same keyboard layout installed on my MacBook Pro (running macOS Mojave), but I get the circumflex (for ĉ, ĝ, ĥ etc.) with Alt/Option+6 and the hoket (for ŭ) with Alt/Option+b. Other than that, that's pretty much spot on.